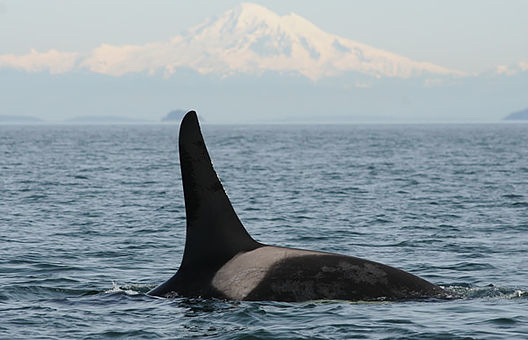 When it comes to the killer whales that frequent Puget Sound, a year can make all the difference in the world. Last year at this time, we were celebrating a remarkable baby boom — eight new orca calves over the previous 12 months. See Water Ways, Dec. 16, 2015. J-34, named DoubleStuf, swimming last February with Mount Baker in the background. The 18-year-old male died this month. Another new baby was added in January of this year, for a total of nine. But if 2015 was the boom year, then 2016 turned out to be a major bust, with six orca deaths recorded during the calendar year. The latest death among the Southern Residents was J-34, an 18-year-old male named DoubleStuf. He was found dead floating near Sechelt, B.C., northwest of Vancouver, on Dec. 20. Check out the tribute and wonderful photos on Orca Network’s webpage.